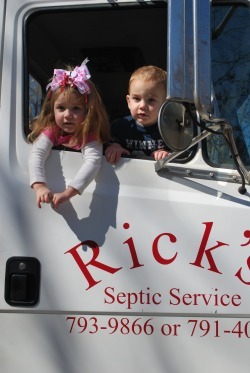 Ricks Septic Service is a family owned business proudly serving the area of Warren and surrounding Counties of South Central Kentucky. Since the start of our business we have grown from a home made pump truck, servicing less than 50 tanks the first year to today, with a truly professional setup servicing multiple tanks every day. We are extremely proud to say that customer loyalty and word of mouth has been the biggest contributer to our success. We take pride in providing quality and dependable services to our customers and look forward to serving you. We are commited to serving our customers by providing Septic Tank Pumping and Sewer Line Cleaning. We understand the need for promt service when a septic problem arises and can usually respond the same day. We employ qualified technicians and professional equipment to ensure that you recieve high quality results. Why do car owners change the oil in their car? The answer to that is obvious; to prolong the life of the engine. In fact, homeowners should have their septic tanks pumped for the same reason. Your septic tank is there specifically to allow your septic system to be maintained. Use it to prolong the life of your system. The Kentucky Health Department recommends that septic tanks be pumped every 3 to 5 years. "We want to know what you thought about our service. Good or Bad click here to tell us about it."